Oui! il est doux! l'odeur! Ooo la la! I comme la lavande. NEW! French Lavender, knows what it wants, it's calm, collected, it's French. Experience soft lavender notes, plant based moisture, and a clean feeling every time you use this soap. We like our soaps just like we like our bread, fresh, pure, and made with quality ingredients. 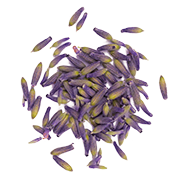 Lavender is known for its ability to calm, center, help with stress and anxiety. It's one of the most gentle essential oils, suitable for the entire family. Lavender aids better concentration, promotes peaceful sleep, and calms the mind and body. No fillers! No artificial colors! Just lots of suds and natural luxury.